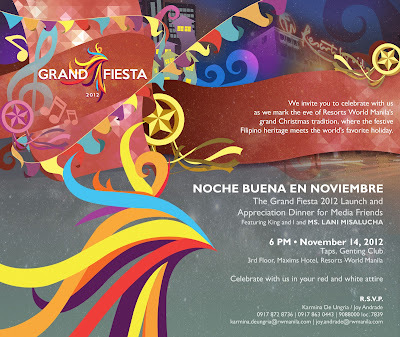 The Grand Fiesta 2012 Launch and Media Appreciation Night dubbed as “Noche Buena En Noviembre” featured several performers top-billed by Ms. Lani Misalucha and the cast of The King and I. It was held last November 14 (Wednesday), 6:00pm at the Genting Club, Maxims Hotel. With such grand offerings as the current staging of “The King And I”, the search for Miss Resorts World Manila 2012, and the soon to be launched Grand Fiesta 2012- the grandest and longest Filipino Yuletide celebration in the world, the country’s first integrated lifestyle hub shall give its media partners a taste of how nothing compares to Resorts World Manila. If you want an integrated lifestyle hub with three international lodging brands: Maxims Hotel, Marriot Hotel Manila and Remington Hotel, join us and relax to the newest destination, only at the Resorts World Manila. Resorts World Manila (RWM) is a leisure destination in the Philippines that features exciting recreational thrills, superlative performances, unique evenst, and spectacular lifestyle options. Conveniently located across Ninoy Aquino International Airport 3, RWM is an instant gateaway to world- class Philippine hospitality. Yuletide celebrations in the country has never been this exciting as the Philippines first one- stop, nonstop vacation spot for topnotch entertainment and world- class leisure alternatives, Resorts World manila, prepares anew for its grandest Christmas celebration yet, the Grand Fiesta 2012. Brandishing a variety of the most spectacular offerings the Philippines can show the world in culture and the arts, food, tourism, hospitality, entertainment, and merry-making, the Grand Fiesta 2012 and other noteworthy attractions of this integrated lifestyle hub expects a throng of visitors from around the globe this fourth quarter. The six week festivity will be highlighted by a serious of high caliber concerts featuring the return of Grammy award trumpeter Chris Botti; Las Vegas New Siren of the Strip Ms. Lani Misalucha; the Von Trapp Children, the singing group descendend from the rea- life maria and Georg Von trapp of Sound of Music fame, Taiwanese Idols Xu Fu Kai, Cao Ya Wen, Caijia Lin and Guo Ting Jun, and a host of other foremost local and international talents. Another highlight is the first- of- its- kind daily 3D- projection Show at the stately Plaza of Resorts World manila’s Newport Mall. Using state-of-the-art 3D projection technology, the shows will tell various Christmas stories, with a new installment introduced every week. Much like the eagerly awaited Christmas on Display (COD) shows in old Cubao, circa 1980′s, resort World Manila’s 3D- Projection Shows will feature a heartwarming Christmas story with spectacular visual effects and life like imagery. Other notable events are the Miss Resorts World Manila 2012, the giant Christmas tree- lighting ceremony, Indoor Electric parades, Chorale Competition, Pinoy Ultimate jeepney (PUJ) Awards, Cake- Off Challenge, and as much much more. Daily entertainment featuring the top local performers in the country happens at the Newport Plaza starting December 1, 2012. Experience a sensational nonstop offering of unique Filipino revelry each day starting November 23 until the New Year’s, as magicians, mimes, buskers in stilts, and other street performers greet guests all day ling in the jovial fairground of Resorts World Manila. Enjoy food galore with the many attractive discounts for members via the Food Festival all weekdays of December. 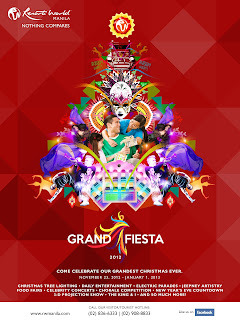 Poised as a truly family- bonding marathon, the Grand Fiesta 2012 is definitely the absolute celebration everyone should experience this season. 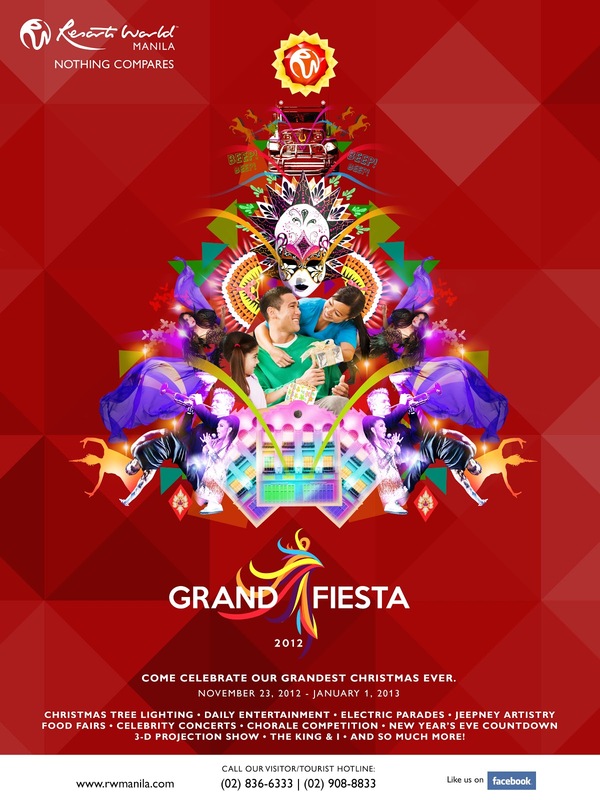 The Grand Fiesta 2012 culminates with a simultaneous four- party revelry for the New Year’s Eve countdown on December 31, at the exclusive Genting Club, Bar 360, the Newport Mall Plaza, and at the Marriot Hotel.